Happy 37th Birthday to the beard-wielding, riff-raging, slide-slinging guitar master, Derek Trucks! The guitar has always been a centerpiece in Derek’s life – purchasing his first for only $5 at a garage sale at the age of 9, and continuing to not only master, but dominate his craft. As a 3x LOCKN’ ‘Lumni, we’ve been lucky enough to make countless memories and witness special moments surrounded by his music. To celebrate, we’re blowing out the birthday candles for Derek by rocking out to some insane live performances from his career. We’ll see you in August, Derek! 1. Check out little Derek at 13 years old opening for Allman Brothers Band on July 4th, 1993 for this classic “Layla” jam. It’s easy to see why Derek would later join the Allman Brothers Band as a full-time member! 2. Remember that time Gov’t Mule invited Gregg Allman, Trey Anastasio, and Derek Trucks on stage to play “Soulshine?” It’s not everyday you get to see so much talent share the same stage. Jump to 5:09 to hear Derek’s glorious solo and guitar battle with Warren and Trey at this performance from the 2007 Jammy Awards. 3. Blues icons collide in this clip of Derek and wife Susan Tedeschi sitting in with the late B.B. King on June 28, 2011 at London’s Royal Albert Hall. Derek’s tasteful slide guitar and Susan’s soulful voice pair perfectly with B.B. King’s old-school blues licks. 4. President Obama has been known for hosting some of America’s top performers during his time as Commander in Chief, so it should come as no surprise that Derek was among those artists asked to play at the White House. Check out Derek’s emotional interpretation of “I’d Rather Go Blind” with Susan Tedeschi and Warren Haynes from February 27, 2012. 5. At last year’s LOCKN’, we had the pleasure of honoring Joe Cocker and Mad Dogs & Englishmen with Tedeschi Trucks Band and Friends. This entire performance is absolutely amazing. There are no words to describe it — you have to see it with your own eyes. 6. Watch as Derek takes one of the most gorgeous solos of all time with Allman Brothers Band at one of their famous Beacon Theatre shows in 2003. His tone and phrasing are simply out of this world! 7. The 2014 Superjam at Bonnaroo hosted by Derek Trucks featured a ridiculous lineup including Chaka Khan, Ben Folds, Willie Weeks, Susan Tedeschi, Taj Mahal, Eric Krasno, Adam Deitch, and Nigel Hall, among others. You should probably listen to the entire set while you’re at it. 8. It’s hard to believe one man could actually be this talented, but when Derek Trucks performed “Soul Serenade” at Guitar Center’s King of the Blues Competition in 2010, he proves that he is the ruler of all things guitar! 9. While this song is called “I’d Rather be Blind, Crippled and Lazy,” Derek has established himself as one of the hardest working men in show business. The interplay between the guitar and keys is out of this world as he trades off with Kofi Burbridge in this soulful performance from 2006. 12. Derek Trucks takes yet another electrifying solo in this performance of “Rockin’ Horse” live at the Beacon Theatre in 2003 with Allman Brothers Band. Few can match the level of depth found in Derek’s playing with such an honest and sincere delivery.﻿ The Allman Brothers might have disbanded last year, but lucky for us, Derek is showing no signs of slowing down anytime soon! 13. You might think that in order to play guitar, you need to have strong and versatile fingers. 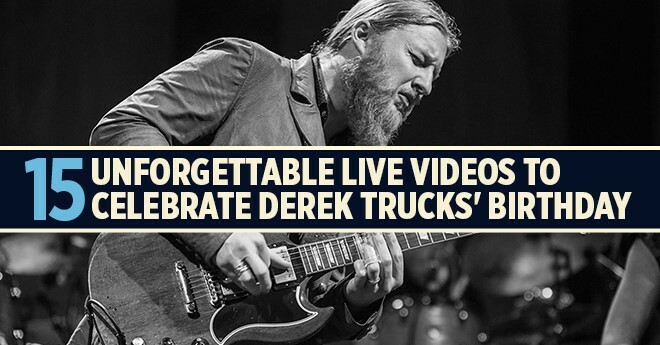 Well, leave it to Derek Trucks to prove you wrong! Watch as Derek leads the Tedeschi Trucks Band through “Keep On Growing” the day after a fishing knife incident left him unable to use his left index finger. This three-fingered solo from March 26, 2016, is definitely a unique moment in TTB history that will leave you speechless. 14. On Friday, January 10, 2014, music stars and friends joined together for “All My Friends: Celebrating the Songs & Voice of Gregg Allman,” a special concert in honor of the legendary singer, songwriter, and musician. In this 13-minute version of the Allman Brothers Band classic, “Whipping Post,” Derek Trucks lays down a flawless solo that would undoubtedly make Duane Allman proud. 15. Eric Clapton has been acclaimed as a guitar hero since he first surfaced on the London blues rock scene in the 1960s. In this performance of “Little Queen of Spades” from the 2007 Crossroads festival, it’s clear why Clapton let’s Derek take the last solo… you always save the best for last!